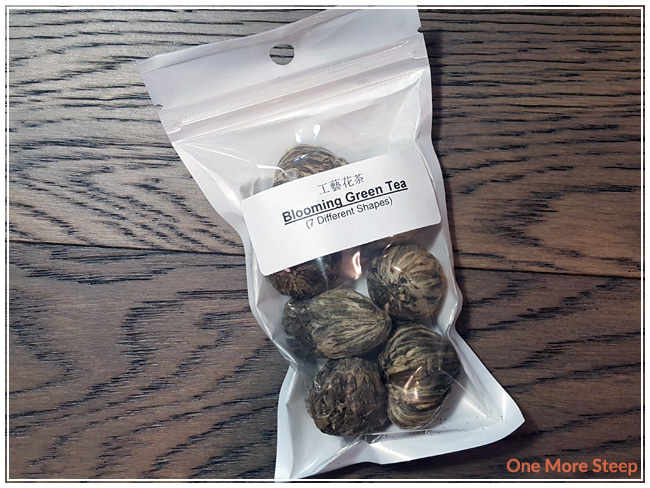 The Chinese Tea Shop’s Blooming Green Tea was a purchase at the most recent Vancouver Tea Festival (and I’m just writing about it now – shame on me!). If you’ve been reading here for a while now, or following me on Instagram (@onemoresteep), you will know that I’m a sucker for a good blooming/flowering tea. 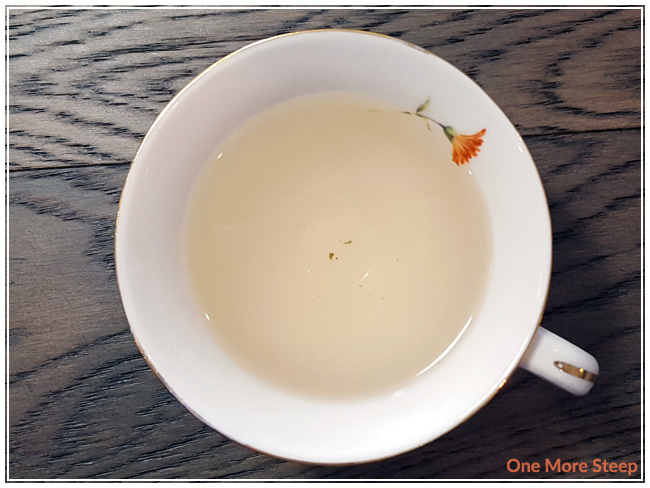 The unfortunate thing about blooming teas is that they are just not cheap – it takes skill to make them and they’re just beautiful to watch unfold and bloom in your teapot. I always recommend steeping one of these in a clear glass teapot (or teacup, if that’s more of your style) just so you can watch the magic happen. So the bag I had bought contains seven different shapes (designs). These tea leaves are tied together, by hand, using silk thread. There’s not even a little hint from the dry tea ball about what colour the flowers are on the inside. The aroma from this little ball is sweet floral, with a light background of the green tea. There weren’t any steeping instructions on the packaging. I filled up a glass teapot with water that was heated to 79°C (175°F) and dropped the ball in. I waited until it had fully bloomed prior to pouring myself a cup – the whole process took about 2 minutes (120 seconds). Blooming Green Tea steeps to a pale orange, with a pleasant floral aroma. There’s a nice sweetness to this tea, which is capitalized by the fact that there is no bitterness or astringency given the length of time I steeped it for. 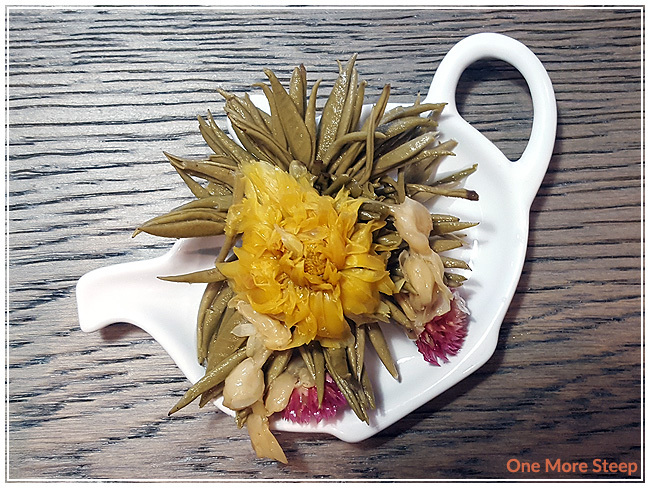 This flowering tea made for a smooth cup of tea and it was very pleasant to drink. 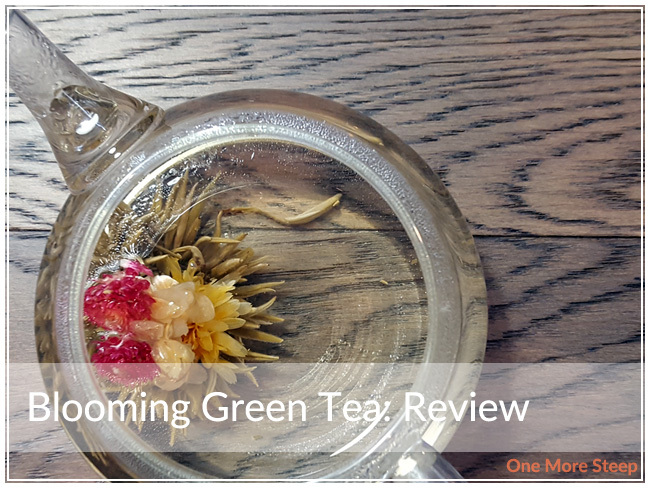 I resteeped Blooming Green Tea twice (three times total) and found that the floral flavours stayed present throughout. A few petals and tea leaves were knocked loose each time I filled up the teapot, which wasn’t too much of a hassle for me to pull it out. The flowers are really quite beautiful. I’m not an expert, but I believe they are globe amaranth, chrysanthemum, and jasmine. I loved The Chinese Tea Shop’s Blooming Green Tea. 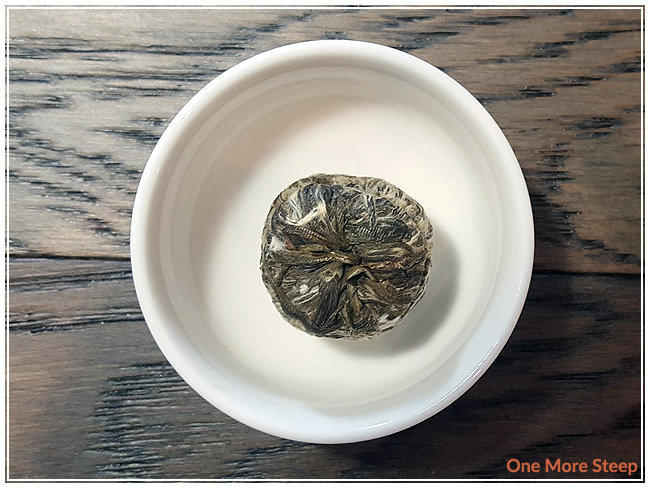 There is just something really relaxing about watching a ball of tea open up and ‘bloom’. If you’ve never had the opportunity to try one, I definitely recommend it. It’s just a lovely experience to watch – and the fact that the tea is tasty and holds up to resteeping doesn’t hurt either!